Mike Bennett Author: The Hardback and Paperback Now Available to Buy. The Hardback and Paperback Now Available to Buy. 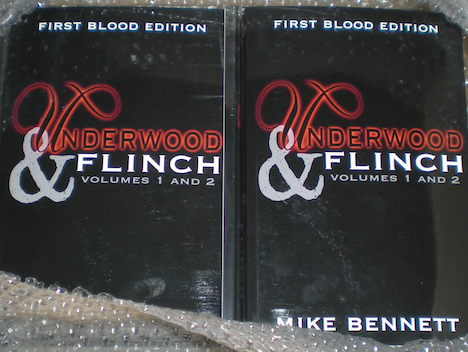 OK, here it is, for everyone who doesn't want the two individual ebook volumes of U&F at $2.99 each, I present the paperback and hardback all-in-one volumes. The hardback is the high-end luxury product, with the paperback as the more affordable option. Yes, they aren't as cheap as stuff you see on Amazon, but remember, there are two novels in one volume, and that's a lot of paper. If U&F were in the hands of a "real" publisher, the books would be edited down to a fraction of the size. The hardback is priced as it is so I can make a modest profit from any Amazon sales (because Amazon want their cut, too). The paperback is priced as it is because I've kept it OFF Amazon in order to keep the cost down. For this reason, only the hardback has an ISBN (international standard book number, which is what retailers need to sell it in their stores). For both books, discounts exist ONLY at Lulu, and that's where I urge you to buy. Once again, my huge thanks to all the U&F Fundraisers for helping to make this happen. Your names adorn the dedication pages! NB: There's a printing and delivery time of over a week - I know, not ideal, but that's self-publishing companies for you.